BELLEFONTE — Out with the old, in with the new. 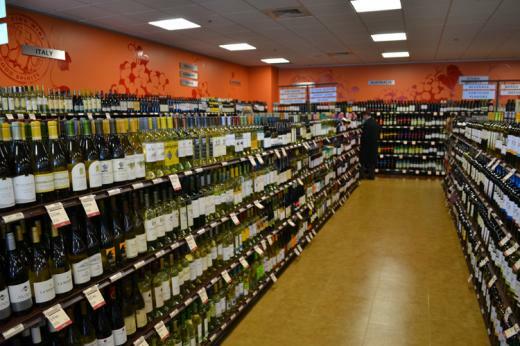 If you're purchasing liquor or wine in Bellefonte, there's a new store in town. The Pennsylvania Liquor Control Board officially opened the doors of its new Bellefonte location on Tuesday. The new store is located at 178 Buckaroo Lane, right next door to the new Weis Markets. The downtown Wines and Spirits shop officially closed its doors on Monday night. According to Horst, when the PLCB started looking for a new location, the open spot on Buckaroo Lane practically jumped off the map. In addition to outgrowing the store in downtown Bellefonte, there was always the issue of parking. Without a large parking lot or garage nearby, customers had to jockey for a parking spot. That won't be the case at the new location, where parking is plentiful. “That's one of the improvements here. Customers want one-stop shopping. This gets them about as close to one-stop shopping as we can,” Horst said. The store offers 1,500 wine products and 900 spirits products, spread out over 4,555 square feet of space. The store will be open from 9 a.m. to 9 p.m. Mondays through Saturdays and from noon to 5 p.m. on Sundays. “We're still confined by legislative law that only 25 percent of our stores can be open on Sundays. We are actively trying to select the correct stores to be open on Sunday. If we're located next to a seven-day-a-week, 24-hour supermarket, then we try to open the store on Sunday,” Horst said. The new store officially opened its doors on Tuesday morning. Shoppers liked what they saw from the new location. McMullen said that he likes the fact that the store is right next door to a supermarket. “When we go to Myrtle Beach (S.C.) that's the way it is there. You get everything in the supermarket,” he said. McMullen was shopping with his wife, Joan. During the grand opening, shoppers sampled cheese from Weis Markets and wines from Subarashii Kudamono Co., Inc.
Holly Harter of Hazelton poured samples of the signature Asian Pear Wine. She, too, was impressed with the new store. “I love it, I think it's wonderful,” Harter said. The Asian Pear Wines and Spirits will be available year-round in the Bellefonte location. Previously, the wines and spirits were only available at the North Atherton store, Harter explained. For more information about the store, visit www.finewineandgoodspirits.com. When: Store hours are 9 a.m. to 9 p.m., Monday through Saturday; noon to 5 p.m., Sunday.